Santa: I gotta get married? Bernard: Yes. It's the Mrs. clause. It's always tough to produce a viable sequel to an audience favorite, but the task becomes especially arduous as the years fly by. Reuniting cast members can be problematic, child actors grow up, and maintaining a link to the beloved original while trying to attract a new audience with a fresh story often taxes the most talented screenwriters. Although eight years have transpired since the release of The Santa Clause, its entertaining 2002 follow-up largely succeeds in bridging the gap. Yet in trying so hard to please the widest possible audience, The Santa Clause 2 suffers from an extended bout of cinematic schizophrenia. The Santa Clause 2 is really two films with two stories and even two Tim Allens. One appeals to kids (and transpires completely in the Candy Land fantasy world of Santa's North Pole workshop), the other to their parents (which takes place in more realistic, relatable suburbia), and the two never converge until the movie's final minutes. The film's split personality might have worked better if both plots possessed strong elements. But while the "adult" story is sweet, heartwarming, romantic, and bursting with seasonal cheer, the "kid" story is too much of a silly, gimmick-filled departure, and becomes distracting and grating as the film wears on. So, like the toys in our Christmas stockings, The Santa Clause 2 is very much a mixed bag. And yet, like Christmas itself, it's almost impossible to resist. As the movie opens, all seems well at Santa's Workshop as preparations for Christmas kick into high gear, but soon Santa (Tim Allen) gets a double dose of distressing news. First, he learns his now teenage son Charlie (Eric Lloyd) has turned up on The Naughty List, thanks to some rebellious adolescent pranks. Then, his two right-hand elves, Bernard (David Krumholtz) and Curtis (Spencer Breslin), divulge a hidden condition buried in the fine print of Santa's contract. "The Mrs. Clause" states unequivocally that Santa must find a wife by Christmas Eve (only 28 days away) or else surrender his title and position. Such a thought horrifies Santa (a.k.a. Scott Calvin), yet as the clock ticks, the "de-Santafication process" begins, and Santa finds himself losing his waistline, beard, and white hair. Santa/Scott plans an extended stay in his hometown to straighten out his son and find a legitimate mate, but how can Christmas preparations continue without the head honcho overseeing all the work? Curtis suggests putting Santa in his elaborate toy duplication machine, where a fake Santa clone will be created. This synthetic Santa will provide a comforting presence during the Christmas rush and keep the elves on task. Of course, the more Santa Clone (also played by Allen) impersonates Santa Claus, the more power-hungry he becomes. A North Pole coup seems inevitable, especially after Santa Clone duplicates and enlarges an army of toy soldiers who impose martial law on the poor, bewildered elves. Meanwhile, Scott tries his best to defrost Carol Newman (Elizabeth Mitchell), the beautiful ice-maiden principal at Charlie's school. Scott's magical abilities help thaw their chilly relations, and a budding romance develops. But when Scott's magic well runs dry, he must enlist the help of the Tooth Fairy (Art LaFleur) to get back to the North Pole, confront his evil twin, and�what else?�save Christmas. Allen is cuddly and caring, and handles what really amounts to three roles (Santa Claus, Santa Clone, and plain old Scott) with aplomb. I found it hard to accept him as the new jolly St. Nick in the first Santa Clause movie, but Allen has definitely grown into the role and fills the classic red suit like it was made for him. His performance holds The Santa Clause 2 together and seamlessly links its competing plotlines. Although Michael Lembeck honed his craft directing countless episodes of sitcom TV, The Santa Clause 2 is his feature film debut. He keeps the pace moving, draws amusing performances from his cast, and appropriately tugs the heartstrings, but the overdone Santa Clone subplot threatens to sabotage his good work. As the mutant St. Nick, Allen�plastered with prosthetics and gussied up in full military regalia�resembles a Saddam Hussein blow-up doll with a Buzz Lightyear voice, while the monstrous toy soldiers stagger around like Night of the Living Dead zombies as they chase frightened elves. Not pretty images for a holiday film, but kids gobble it all up like a plate of iced Christmas cookies. Call me old-fashioned (or just a mature adult), but I much prefer the film's "real world" scenes, in which Lembeck masterfully balances comedic and sentimental moments to maintain a light, festive mood. Allen and Mitchell enjoy marvelous chemistry, and watching Carol (and her co-workers) recapture their child-like Christmas wonder is the film's unqualified highlight. Their yuletide joy is contagious, and sparks our own youthful holiday memories. Such warm, nostalgic feelings fuel the film and allow us to forgive the dopey North Pole interludes. Despite some missteps, The Santa Clause 2 keeps the magic of Santa alive and infuses the whole family with plenty of Christmas spirit. And you can't ask for much more from a holiday film. Image Transfer Review: As crisp as a winter's evening, The Santa Clause 2 looks marvelous on DVD, with all the fanciful sets and costumes possessing deep, lustrous color. (Reds�of course�are especially well saturated.) Lines are sharp, but still smooth, fleshtones remain natural, and little evidence of edge enhancement exists. Contrast and shadow detail are also excellent, and you can count on one hand the number of specks or scratches on this very clean anamorphic print. Disney scores again. Audio Transfer Review: The active DD 5.1 audio gets good mileage from the film's multitude of special effects, with some solid surround presence (especially during flight sequences) and rich, resonant bass. Dialogue is always clear and distortion is blissfully absent. The Santa Clause 2 isn't an action flick, but it often sounds like one. Extras Review: While not labeled a special edition per se, The Santa Clause 2 includes enough extras (most of which are geared toward kids) to warrant such a distinction. The fun kicks off with the innocuous Inside the North Pole with Curtis, a personal tour of the film's set with the alternately lovable and annoying child star, Spencer Breslin. At 10 minutes, the piece outlasts its novelty value, but features several entertaining moments and allows kids to see what really happens on a movie set. We follow Spencer to his on-set "school," sit next to him in the make-up chair, and watch various costumers fuss over him. In between, he discusses his rivalry with fellow elf Bernard (David Krumholtz), conducts typically precocious (and goofy) interviews with leading lady Elizabeth Mitchell and director Michael Lembeck, and introduces various technical personnel. As if that weren't enough, Lembeck takes us on his own four-minute Director's Tour of Elfsburg, apparently made to calm Disney executives who were worried about on-set strife. Elizabeth Mitchell once again adds some welcome glamour, and we hear from a few elf extras. A four-minute Gag Reel offers the usual flubs and crack-ups, while True Confessions of the Legendary Figures features a three-minute collection of interviews (conducted by Lembeck) with such childhood celebrities as Mother Nature (Aisha Tyler), who talks about her affinity for leather pants; the Easter Bunny (Jay Thomas), who likes Santa, but feels the rest of the cast is weak; Cupid (Kevin Pollak), who cites tension with the Easter Bunny; Father Time (Peter Boyle); and the Tooth Fairy (Art LaFleur). A fluffy, but enjoyable diversion. Lembeck also provides a scene-specific audio commentary with an appropriate Disney twist. To preserve the magic and wonder of his film, Lembeck makes us believe he actually shot The Santa Clause 2 on location at The North Pole, employing honest-to-goodness elves and Santa himself (who was apparently quite welcoming and cooperative throughout the shoot). Lembeck sprinkles in some interesting details along the way (like the fact that mounds and mounds of paper snow were often spread over exteriors due to the absence of the real thing), but only true Santa Claus (and Santa Clause) fanatics will want to hang in there for the complete 104 minutes. A collection of seven deleted scenes, totaling 12 minutes, includes introductions by Lembeck, who explains the reasons for the cuts. Although the director would like us to believe differently, nothing particularly essential was left out. Most of the scenes are at least substantive�a nice change from the brief snippets many discs offer. Operation Toybox: Save Santa Game is a surprisingly challenging game in which players must try to free the real Santa from the clutches of Santa Clone in order to save Christmas. Answering trivia questions about the film and surviving a couple of scuffles with those pesky toy soldiers (all using the DVD remote) help you achieve your goal. Completing the disc extras, the Bonus Features page contains three easter eggs that offer amusing animations employing the film's notorious toy duplicator. The Santa Clause 2 also includes extensive DVD-ROM features. Santa's Libs is a computerized version of the popular Mad Libs party game, but in this case players select from a list of responses, then read the resulting story with their answers automatically plugged in. Holiday Rush challenges players to clear a board of holiday-themed tiles by clicking on adjacent pairs, while Reindeer Games involves selecting colored noses from various reindeer and trying to replicate a hidden pattern. Finally, a Christmas Coloring Book allows the creatively inclined to "paint" a variety of movie scenes and then print the resulting colorful masterpiece. No lump of coal here. 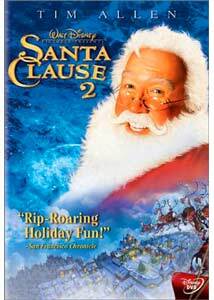 The Santa Clause 2 offers breezy entertainment that will appeal to the whole family. The film's heart, whimsy, humor and infectious holiday spirit overshadow its over-the-top lapses. Disney's superb transfer, top-notch audio and wealth of family-friendly extras make The Santa Clause 2 an ideal stocking stuffer.